It’s warm, nourishing with a surprise taste twist at the end! This soup is like wrapping your insides in a warm, velvety blanket of goodness! With layers of flavor and a creamy smooth texture, it delivers all the feels you could want in a bowl of winter soup. It’s so easy to make this soup boring, bland and flat. Like me, I bet you’ve slurped many bowls saying this is “meh” while reaching for more salt, pepper or herbs to make it come alive. The KEY to creating curious layers of flavor in the soup is taking the time to 1) roast and caramelize the butternut squash, 2) use home made vegetable stock - I adore this one from the best place to eat in Venice Beach - Gjelina, and 3) use aromatics at different flavor points of cooking and eating the soup. After many, tries at creating the best bowl, I came upon the recipe I adapted below from Thomas Keller’s, french bistro Bouchon in Yountville, CA. Adding browned butter to the soup as a finisher is genius! 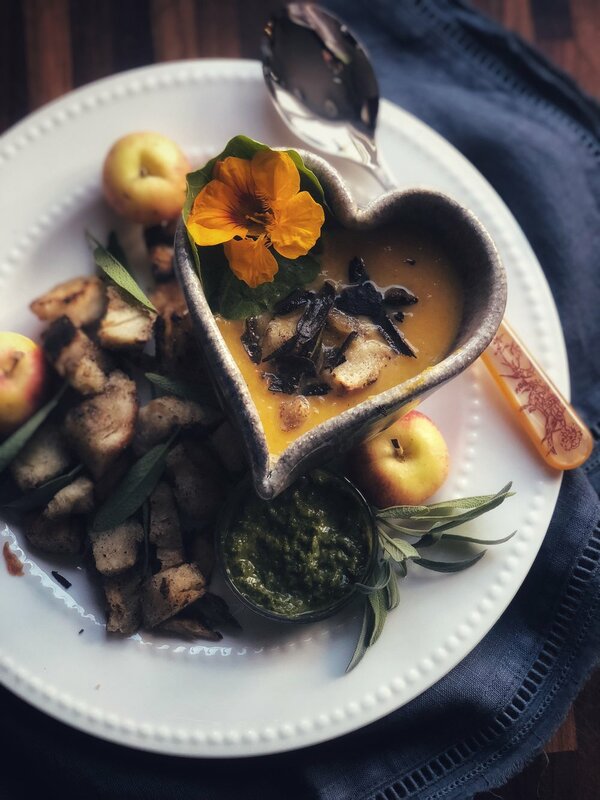 I realize time is not always on your side when it comes to cooking up something nutritious and delicious - so I’ve given you two of my fav ways to make butternut squash soup. One short and sweet, the other Bouchon’s version a bit more robust in ingredients, time and flavor, but so worth it! You’ll learn how to make a bouquet garni from leek leaves, a vegetable soup stock from the best stock maker straight out of Venice Beach, CA, and why I’m onboard with ditching pancetta for the French version, called ventrèche. PLUS there is a bonus unexpected flavor that I’ve found to pair with the soup - look for it at the end of the recipes. 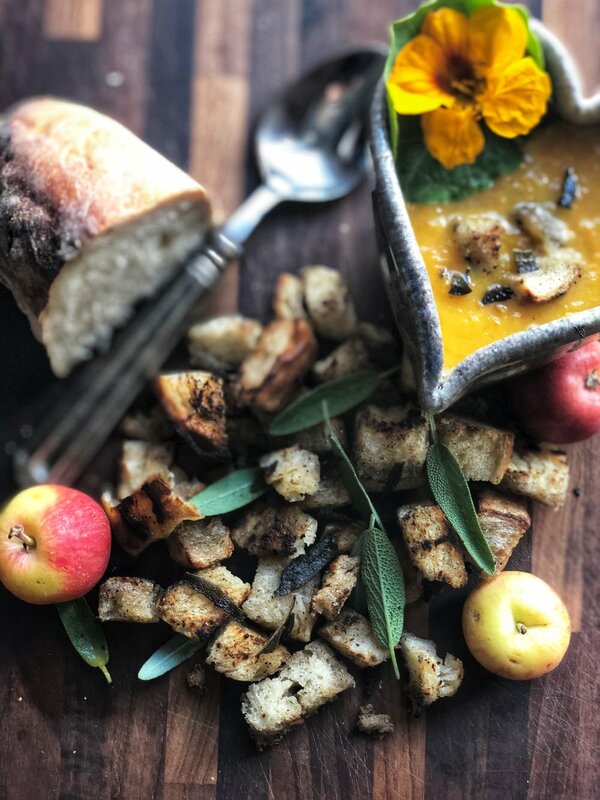 Here’s to hearing your collective ah’s as you bring bliss to warm your belly with my version of a Roasted Butternut Squash Soup with Brown Butter, Sage and Toasted Sourdough Croutons. This soup is an easy crowd pleaser and can be adapted for all types of food lovers. You can make for the vegetarian, vegan, gluten free, or dairy free loves in your life. I’ve made recommendations on how to do this in each recipe. Make the soup ahead of time, and you have a quick hearty meal for holiday guests or as a fast way to nourish yourself in between the mad dash of holiday shopping and preparations. Recommend using organic, local and fresh harvested ingredients whenever possible. Support your local growers by shopping from the Farmer’s Markets in your community. 1/4 cup thinly sliced (1/8-inch thick) leeks, white parts. Reserve green leaves for later. optional garnish: fried pancetta, ventrèche or bacon (yum)! Preheat the oven to 350° F. Line a small baking sheet with aluminum foil or parchment. Cut the neck off the squash and set it aside. Cut the bulb in half and scoop out and discard the seeds. Brush each half inside and out with about 1 1/2 teaspoons of the canola or olive oil. Sprinkle the cavities with salt and pepper and tuck a sprig of sage into each. Place cut side down on the baking sheet and roast for about 1 hour, or until completely tender. Cut the fennel bulb in quarters, brush with oil, sprinkle with salt and pepper. Add to the baking sheet of squash or use a separate pan. 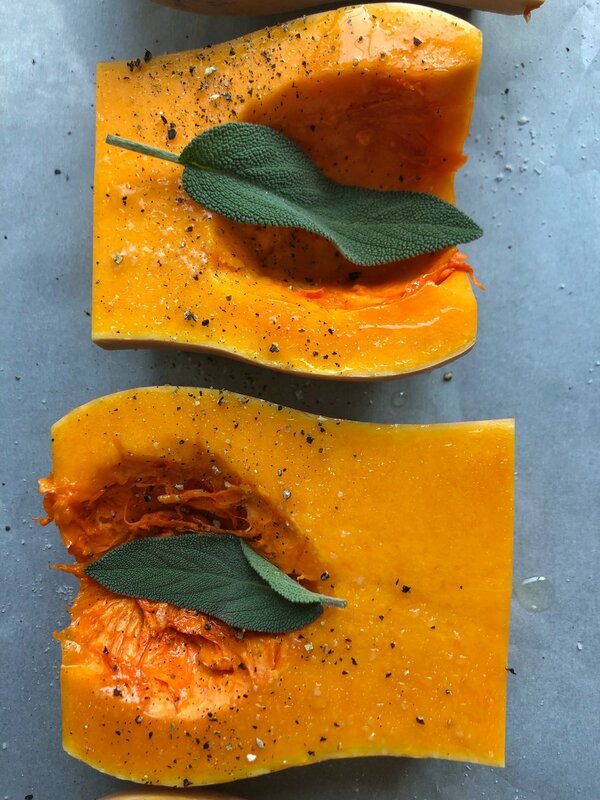 Roast in the same oven as the squash for 30 minutes or until soft and browned. Turn at least once halfway during roasting time. Remove the squash and fennel from the oven. Let the squash cool, then scoop out and reserve the flesh (discard sage). Meanwhile, using a paring knife or a peeler, carefully peel away the skin from the neck of the squash until you reach the bright orange flesh. Cut the flesh into 1/2-inch pieces and set aside. (you should have about 4 cups). Make the bouquet garni by laying flat two leek leaves slightly overlapping each other. In the middle, layer on top of each other the parsley, thyme, bay leaves and black peppercorns. Fold over the leek layers to make a bundle. Use cotton kitchen twine, to tie it shut. See the picture in the gallery below for how it should look. Put the remaining canola or olive oil in a stockpot over medium-high heat, add the leeks, carrots, and onions and cook, stirring often, for about 6 minutes. Add the diced squash, garlic, 1 1/2 teaspoons salt, and 1/2 teaspoon pepper and cook gently for 3 minutes, reducing the heat as necessary to keep the garlic and squash from coloring. Stir in the maple agave nectar or honey and cook, stirring, for 2 to 3 minutes. Add the stock and bouquet garni, bring to a simmer and cook for 10 to 15 minutes or until the squash is tender. Add the roasted squash and fennel. Simmer gently for about 30 minutes for the flavors to blend. Remove from the heat and discard the bouquet garni. Transfer the soup to a blender, in batches, and puree. Strain the soup through a fine sieve into a bowl. Taste the soup and adjust the seasoning. At this point you can go on to step 8 to serve immediately or cool the soup and refrigerate for later. If reserving for later, reheat the soup in pan (if too thick add a bit more vegetable stock) - then continue on to step 8. To make the Brown Butter: Heat a medium light colored skillet over low medium heat. Add the butter and rotate the skillet over the heat as necessary to brown the butter evenly, scraping up any bits that settle in the bottom. As soon as the foaming has subsided and the butter is a hazelnut brown, pour it into the pot of soup. Be careful not to leave the butter over the heat too long, as it can change from rich brown to black in seconds. To make Brown Butter for Vegans/Dairy Free: add 1 Earth Balance vegan buttery stick and 1/2 cup of pecans to skillet. Bring it to a low simmer and let it simmer for about 15 or more minutes. Toward the end, you'll want to watch it carefully as the butter (and pecans) will burn if you leave them too long. Strain out the pecans and let cool. Save the pecans for baking or snacking later. Meanwhile heat 1/8 inch of canola or olive oil in a small skillet. When the oil is very hot, add the sage and cook for 30 to 45 seconds, turning the leaves to crisp them on both sides. When the bubbling stops, the moisture in the leaves will have evaporated and the leaves will be crisp. Drain the sage on paper towels and sprinkle with sea salt. Ladle the soup into six serving bowls. Top each with a dollop of crème fraîche or coconut creme. Grind some black pepper over the top and garnish each with 2 sage leaves, croutons and/or optional garnishes of bacon, fried pancetta, or ventrèche (yum)! What is ventrèche (vohn-tresh) - you say? It is unsmoked, salt cured bacon made from pork belly that is rubbed with herbs and spices from the South of France. I buy mine rolled like one in the link and I’m in amoureux. Cut 1/2 loaf of the sourdough or gluten free bread into 1” pieces. The bread can be fresh or day old. Finely chop 6-8 medium sage leaves. In a cast iron pan or non stick skillet, melt 1-2 tablespoons of unsalted butter (I like grass fed or cultured butter from France or Ireland) or Earth Balance vegan buttery stick on medium heat. When the butter is melted, foam has dissipated add in the bread pieces. Turn heat to med/high to begin toasting the croutons. Turn often to toast evenly. Add the chopped sage in the last 1-2 minutes of toasting. When the croutons are toasted on all sides and have a slight crunch they are ready! Remove from heat and set aside to use as a garnish for the soup. Recommend using organic, local and fresh harvested ingredients whenever possible and support your local growers by shopping from the Farmer’s Markets in your community. optional garnishes: fresh fennel fronds, fried pancetta, ventrèche or bacon (yum)! Drizzle a little olive oil in a 9 by 13-inch glass baking dish. Add the onion, fennel and butternut squash. Drizzle with a little more oil and toss to coat. Season well with sea salt and fresh ground rainbow pepper. Roast for 30-45 minutes until the fennel and butternut squash are tender. Remove from oven and place in a pot and cover with the stock. Bring to a simmer and cook for about 10 minutes. Puree soup using an immersion or traditional blender. If desired add the coconut milk or creme fraîche, taste and add more salt and/or pepper, if needed. Ladle into bowls and top with the optional garnishes. I added just a few croutons to my soup and opted instead to dip the rest of them into a small bowl of Vegan Kale, Cashew and Basil Pesto from Trader Joe’s. This splash of flavor town was the perfect compliment to the soup.